This is the first release from the up and coming 2011 album "W.A.R. on RedMoon7". This will be Floyd Boykin Jr. fourth studio album. 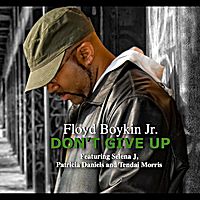 After a very nice 2009 release called EARTHOLOGY, Floyd Boykin Jr. is back with a new single and a new up and coming album. "Don't Give Up" is the first release from the album "W.A.R. on RedMoon7", scheduled for release in July 2011. It features spoken word artist Selena J, Patricia Daniels (you may remember her from EARTHOLOGY: Keepers Of The Earth) and Tendai Morris. You will also hear the hypnotic sounds from guitarist Tracy Mitchell, who played on several tracks on EARTHOLOGY, as well as singing a verse on "Open Letter To My Son". "Don't Give Up" is a very empowering collaborative effort to increase self love, love for humanity, and the passion to never give up on dreams. This single comes with four tracks. The album version, the instrumental, the spokenmental, and a smooth groove mix that will definitely put you in a special mood. Mixed an mastered by the master engineer Marcus Leonard from The Midi Room, "Don't Give Up" will have you singing, rocking back and forth, and feeling good about yourself. Please support this positive music.